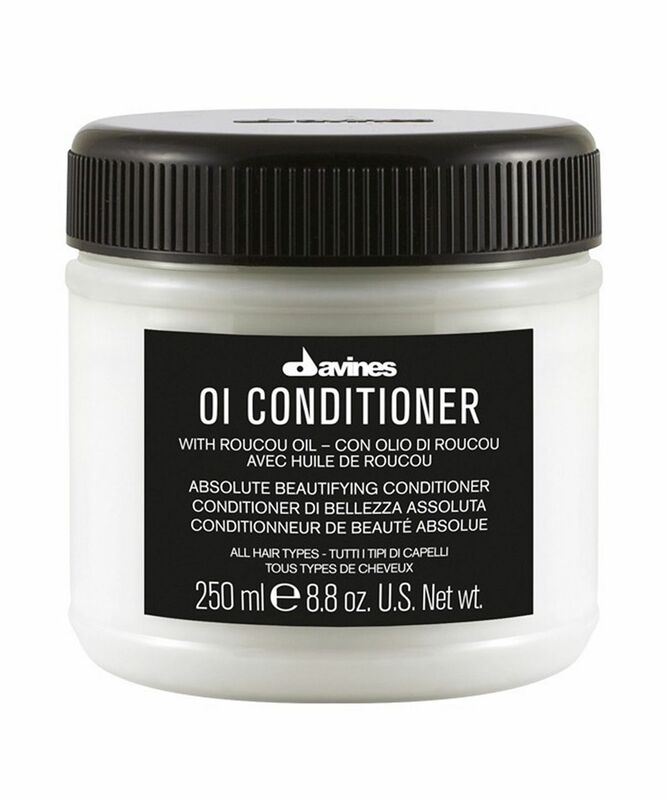 Davines’s gentle, softening and voluminising conditioner is brimming with roucou oil – a potent Amazonian extract derived from the fruit of the achiote – it’s 100 times richer in beta-carotene than carrots and helps to stimulate melanin synthesis (and in turn, maintain your hair’s natural pigment), while its ellagic acid content works to neutralise free radicals and thus protect against cellular damage caused by UV exposure. Incredibly nourishing, this also helps to accelerate the drying process, while shielding strands’ structure from the ravages wrought by heat styling. Just apply through lengths of towel-dried hair – leave for 2-3 minutes then rinse, to leave your locks feeling like silk. The cocktail of nourishing ingredients promotes hair’s shine and manageability, for enviable polish, a super-smooth, frizz-free finish and incredible, salon-worthy ‘oomph’. 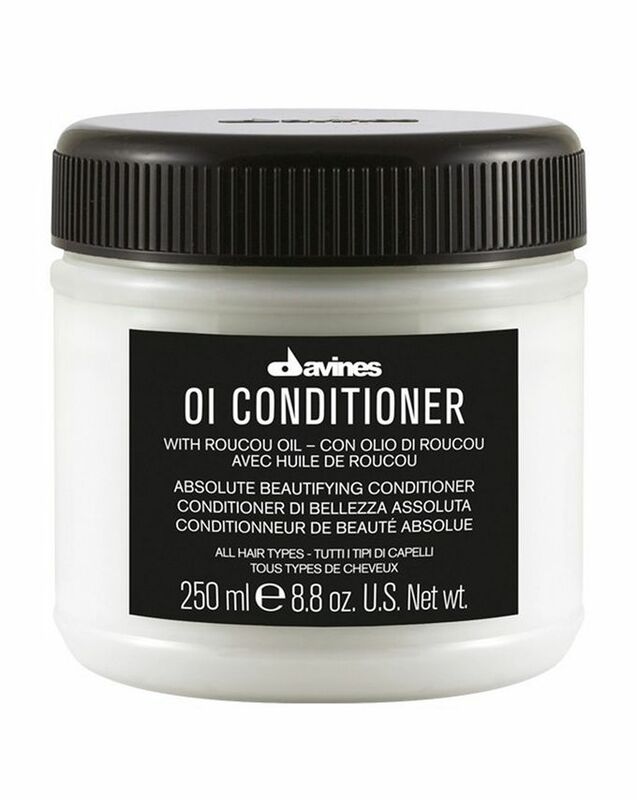 Quirkily cool yet results-driven, Davines’s ‘OI’ range is powered by roucou oil (pronounced ru ‘ku) – a ‘secret’ ingredient beloved by native inhabitants of the Amazon rainforest, who rely on the fruits of the ‘Lipstick Tree’ to protect their skin and hair against the sun and other daily stresses. Intensely replenishing, Davines have harnessed the potency of this wonder-extract to create a range of shine-enhancing, moisture-boosting hair care treatments – suitable for all hair types, these exquisite products are perfect for nourishing, smoothing and ‘controlling’ weakened, dry or tempestuous tresses. By combining high-grade natural ingredients with first-rate scientific rigour, Davines’s founders the Bollati family have expanded their Parmese research laboratory into a multi-national hair care business with an inspiring range of original and authentic products, beloved by discerning celebrities and beauty buffs all over the world. Aqua/ Water / Eau, Cetaryl, Alcohol, Glycerin, Cetrimonium Chloride, Cyclopentasiloxane, Cetyl Alcohol, Benentrimonium Methosulfate, Benentrimonium Chloride, Panthenol, Ethyhexyl Methoxycinnamate. Phenypropyldimethysiloxysilicate, Benzyl Alcohol, Parfum/ Fragrance Dimethicone, Dimethiconol, Citric Acid, Sodium Benzoate, Helianthus Annuus Seed Oil/ Helianthus Annuus (Sunflower) Seed Oil, Citronellol. Bixa Orellana Seed Extract. This must be the best conditioner I've ever tried. It leaves my hair ultra smooth and feeling strong. It's really thick too, so a little goes a long way. Great for over processed, bleached hair like mine! Fabulous! My hair is easy to style now and looks like I’ve just left the salon! Luxurious and beautifully fragrant and doesn’t irritate my sensitive scalp. I use it with their shampoo, it’s such a treat and a little goes a long way so well worth it! Used to really love this conditioner until I realised it contained silicones, which ultimately dry out and damage hair over time. Will not be re-using and have switched to a Green People shampoo and conditioner. I have thick, quite frizzy dry hair which needs A LOT of moisture, I didn't see any results I could not get with the previous less expensive brand I used, unfortunately. There is not a single product from this range that I don’t love. Makes your hair feel amazing and don’t even get me started on the smell. Everything about OI shampoo and conditioner is amazing! This is a great conditioner for dry hair. The smell is quite strong, but I like it and it does linger on your hair. The conditioner can be used with shampoos from other brands. Got this as a free sample & one use is all it takes to impress me. My hair smells good and feels strong (I have fine thin hair bleached multiple times so it has quite weakened), easy to comb and looks volumised until the next day! I wanted to buy the full bottle but it doesn’t ship to my country (Brunei) for some reason :( Need to get my hands on the MELU conditioner too. Leaves hair feeling soft and lovely. Great for dyed hair. I'm still getting used to the scent of this conditioner but that's one small con next to a massive list of pros to this product. I have colour treated, damaged, course but fine hair and this leaves my hair buttery soft, lightweight and easy to style. And along with the shampoo it has started to bring back my natural wavy texture after years of chemical damage had left my hair limp. So this will become a staple in my hair routine. I have extensions, and they get dry and tangled very easily, but this conditioner makes my extensions super soft and smooth. I really cant recommend it enough. I use this conditioner once a week, and leave it on for about 5/10 minutes while I'm in the bath, so the steam makes it feel like a mask, then rinse. I have so many compliments on my hair - and it smells amazing too! The smell is awesome i'm addicted. This product is just AMAZING! I tried so many different conditioner for my hair, more than I can count, but this one is just a miracle product. My hair feel so soft after it, it is easy to brush them and they feel so much more healthy. I am in love and I would definitely recommend it. Thanks Davines for saving my hair. Been using the conditioner and shampoo for about two months. My damaged hair ends are layered, about half a teaspoon is enough to coat it. I've received compliments that it looks glossy - first time ever. Fabulous conditioner! I've got very dry and damaged bleached blonde hair and this conditioner really does the trick. It's extremely thick but dissolves lovely into hair, leaving it full of volume but silky smooth. Don't be put off my price, this conditioner will last months! Will definitely re-order. It's too heavy for my thin and straight hair. I need to use a microscopic amount unless I want my hair to look oily and almost dirty right after a shower. This is the best conditioner ever! When I went away for a couple of days and had to use another conditioner, my hair went so dry in comparison. Literally feel like my hair would be a state without this! The tub is a little bit of a faff (trying to use it in the shower) but at least with a tub you can get every last bit out! This is hands down the best conditioner ever and l have tried many many high end ones. It leaves the hair soft, frizz free, shiny with no tangles and it has a beautiful fragrance. Use it with the shampoo and finish with their famous conditioning spray. I have also noticed that my hair doesn't need shampooing so often. Oh and smells soooo good. It leaves my hair so shiny and smooth. People often comment on how healthy my hair looks like. A little goes a long way so it does last longer than you think. It is a bit pricey but worth every penny. I am on my second bottle and very happy with it. Ultra hydrating conditioner; absolutely fabulous. Three months in and have barely used a third of the jar. So much win. I use this and the matching Davines shampoo. I don’t use this every wash but will do as a once a week treatment or when my hair is in need of urgent TLC. It saved my hair after three weeks of hiking when it was incredibly matted. It is super hydrating. A little goes a long way and the pot lasts me for ages. As with the shampoo, I don’t love the smell but it doesn’t linger and it hasn’t put me off using it. Love love love this conditioner. I usually have to use masks , but this is more than enough to threat my dry hair. And it smells delicious. This conditioner is great in all aspects: smell, texture, results. It is not heavy as mask but quite nourishing though. Smell is fantastic as with all Davines products. And results are amazing: nourished and beautiful hair.